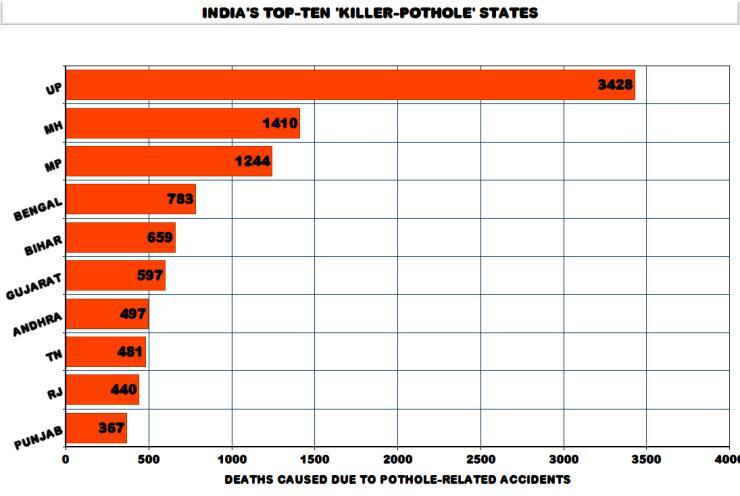 India's no.1 state for killer potholes! India’s no.1 state for killer potholes! Potholes kill! In India, around 7 people die everyday due to potholes. Over the last 4 years, 11,386 people have died due to pothole-related accidents in India. The ministry of road transport and highways has just released a state-wise list of killer-potholes, and it has some chilling figures. India’s most populous state – Uttar Pradesh. In Uttar Pradesh, 3,428 people have been killed due to pothole-related accidents in the last 4 years. And this number is more than double the second most dangerous state with potholes in India, Maharashtra, where 1,410 people have lost their lives. Madhya Pradesh comes third with 1,244 deaths due to potholes. 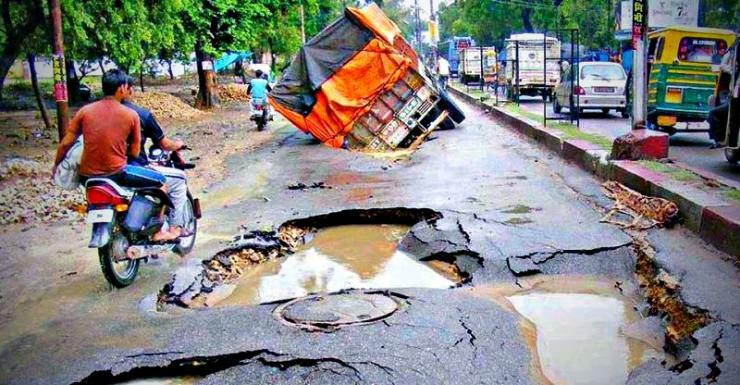 West Bengal (783) and Bihar (659) round up the top-5 of India’s most dangerous states as far as pothole-related accidents are concerned. Gujarat (597), Andhra Pradesh (497), Tamil Nadu (481), Rajasthan (440) and Punjab (367) make for the bottom five ‘potholed’ states. But what causes these killer-potholes? Poor road design is a prime reason for potholes forming. If there is water logging on the road due to inadequate drainage/run-off facilities, the road surface weakens. When heavy vehicles – often overloaded – pass through these weakened roads, the surface breaks down, causing potholes. Overloading. Roads are designed to take a specific amount of load. When overloaded vehicles pass on the road, the surface gets weakened, causing potholes over a period of time. Substandard repair work. When a road is not repaired properly, the chances of potholes reappearing and spreading rapidly is high. Corrupt officials are often hand-in-glove with greedy contractors, and allow the latter to pass off substandard work as high-quality repairs. How can you save yourself from becoming the next victim? Stay very alert on the road. Potholes can be in the most unexpected places and being on the constant lookout for them is one way to minimize damage/avoid them. Don’t swerve wildly to avoid potholes. A lot of accidents happen when people lose control of their vehicles or collide with other vehicles while trying to swerve around potholes. If you’re caught by surprise by a pothole, it’s better to take the impact of the pothole by driving through it rather than swerving wildly. Stay within the speed limit. Taking a pothole at a lower speed greatly minimizes the chances of accidents and vehicle damage. Moreover, it allows you time to safely react to a pothole.